Launched with a $215 million investment as part of the President’s 2016 budget proposal , the Precision Medicine Initiative will build a new database containing medical records and genetic information for millions of Americans, as well as establish new models of patient-powered medical research that promises to accelerate biomedical discoveries and provide clinicians with new tools, knowledge and therapies to select those treatments that will work best for a specific patient’s disease instead of relying on a one-size-fits-all approach. In contrast to personalized medicine in which physicians make treatment decisions based on patient preferences (e.g. one patient may prefer to take a pill each day while another patient may prefer to have a drug infusion once a month), precision medicine refers to using molecular information to improve the accuracy with which patients are categorized and treated. Personalized medicine: patient X with disease Y should get drug Z. Precision medicine: patient X has a subset of disease Y, in particular disease Y3, not disease Y1 or Y2, and patients with disease Y3 tend to respond more favorably to drug Z3, not drug Z1 or Z2. This is already occurring with several types of cancer, where genomic information is helping to shape treatment strategies. For example, the breast cancer drug trastuzumab (Herceptin) works only for women whose tumors have a particular genetic profile called HER-2 positive. Similarly, lung cancer patients with tumors positive for mutations to the gene EGFR respond to the drugs gefitinib (Iressa) and erlotinib (Tarceva). The proposed [Precision Medicine] initiative has two main components: a near-term focus on cancers and a longer-term aim to generate knowledge applicable to the whole range of health and disease. Both components are now within our reach because of advances in basic research, including molecular biology, genomics, and bioinformatics. Furthermore, the initiative taps into converging trends of increased connectivity, through social media and mobile devices, and Americans’ growing desire to be active partners in medical research. You can learn more about the importance of this initiative from Jo Handelsman, Associate Director for Science in the Office of Science Technology and Policy, in the video below. You can also watch an archived webcast of the NIH Workshop on Building a Precision Medicine Research Cohort, which was held earlier this month to discuss the opportunities and challenges around building a large research cohort focused on precision medicine. The workshop heard from several leading experts from many disciplines and sectors, and included Directors from seven NIH Institutes as well as the NCI. Together with the appropriate regulatory frameworks that ensure consumers have access to their own health data, as well as to the applications and services that can securely access and accurately analyze it, the Precision Medicine Initiative promises to revolutionize the treatment of disease and empower individuals and families to invest in and manage their health. 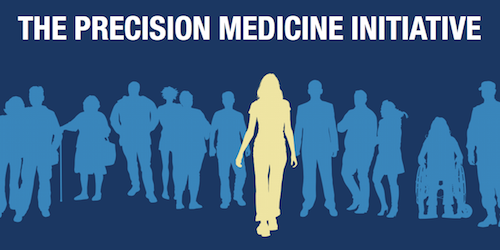 FACT SHEET: President Obama’s Precision Medicine Initiative. The White House. 2015 Jan 30. NHGRI charts course for the next phase of genomics research. NIH News. 2011 Feb 9.